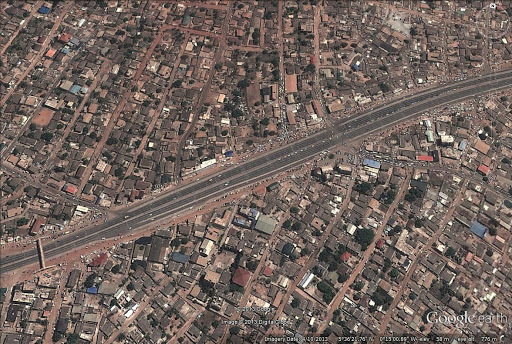 Most drivers from the western-most suburbs of Accra would see the N1 highway as a blessing. Indeed it is considering the ease with which one can now get to or from town in less than thirty minutes as opposed to when one had to spend two to three hours on the road to or from town. The N1 highway has made life a lot easier for drivers and we do owe a depth of gratitude to those responsible for its construction. Being an everyday user myself over the last few months of its completion, however, I have observed several issues with the highway some of which are very obvious, others not so obvious to those unaffected by them. Being an architect and at the moment an urban design student, I think I owe it a duty to my nation to point out some of these problems and to go ahead to propose my ideas of solutions to those issues. I believe that image is everything and as such I shall try to as much as possible put my ideas in pictorial form so that readers can understand them even better and I shall love to hear your feedback on my ideas. The two major issue I have identified have got to do with the following. Apart from problems, however, I have identified some opportunities that the highway presents with respect to more efficient public transport systems and I shall talk about these and make proposals in that regard as well. I have always been baffled about why the designers of the highway would create only a few foot bridges on this really long stretch of highway and worst of all locate them at areas where pedestrian activity is minimal as opposed to areas like the Abeka-Lapaz or Kwashieman junctions where quite obviously there are and always have been a lot of pedestrians crossing the road. As is quite often the excuse in this country, I gather it has something to do with lack of enough resources. The big question however, is that, if there were only enough resources to build a few footbridges, why not put them where they are most needed. Secondly, it is quite baffling to me how these footbridges are designed without any regard for the disabled, especially the paraplegic, wheelchair users and the elderly. It is quite worrying that in this day and age with all the talk about the disability law which was passed quite recently and how to not marginalize such people in society, such a grievous mistake can be made on such a huge scale. I leave it to one’s imagination how such people get across this highway. Sad! Isn’t it? Now the question is, if the mistake has been made, can we not do anything to remedy the situation? I think we can. There are two possible solutions: Build adjoining ramps or build special mechanical lifts as attachment to existing bridges. I personally think mechanical lifts will be a better idea because ramps are too heavy and take up too much space. Correct me if I’m wrong. One might rule out mechanical lifts with the misconception that it involves “rocket science”, which is very often the assumption in this country, but this technology has existed for centuries and there is no need to re-invent the wheel. Just take a look at most multi-storey construction sites around and you would find that this technology is being used extensively already in this country. 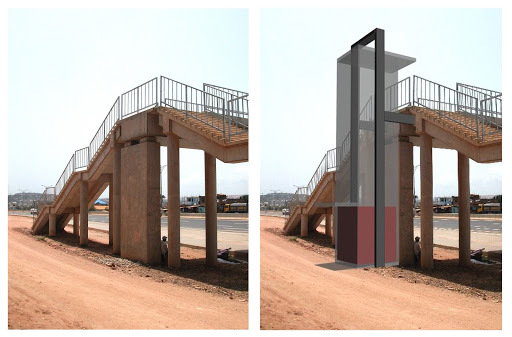 Above is an illustration of how a mechanical lift can easily be attached to the existing bridges to take care of wheelchair users as well as elderly citizens. I’m sure a few ingenious mechanical engineers can easily put this together. Would love to work with anyone interested to design a workable lift for this so please contact me if you are interested. Watch this space for updates to the design. This is just a mock-up of the idea. Is it any wonder that you find pedestrians crossing the highway dangerously despite the wall that were built to prevent that? After-all, any urban designer will admit that as a rule of thumb, most people are comfortable walking 400m, approximately, 5 minutes to get what they need and so we cannot expect anyone to be comfortable walking up to 1km, approximately 12.5 minutes just to climb up a five meter high footbridge and make it across an almost 20m wide highway. I dare to say you can hardly get everyone to comply even in the most disciplined of societies. I believe there is the need for more footbridges at the appropriate locations and most importantly they need to be well designed with a more human face than was done with the existing ones. Watch this space for my take on a more human centered design of a footbridge.